The Pistol Star, a luminous blue variable 1.7 million times as bright as the Sun, and 120-200 times as massive was discovered by the Hubble Space Telescope in the early 1990s. The star surrounded by a huge nebula located near the center of the Milky Way, radiates about as much energy in 20 seconds as does the Sun in a year, is thought to have ejected almost 10 solar masses of material in giant outbursts perhaps 4,000 to 6,000 years ago. 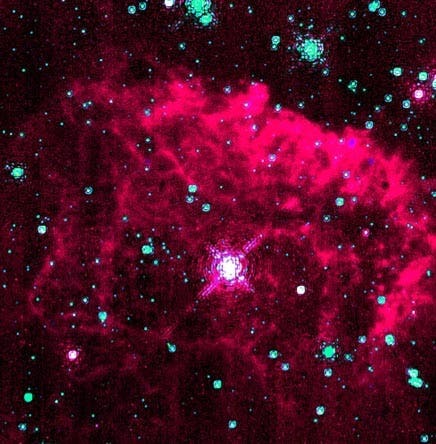 Its stellar wind is over 10 billion times stronger than the Sun's. Its exact age and future are not known, but it is expected to end in a brilliant supernova or hypernova in 1 to 3 million years. Some astronomers conjecture that its large mass may be related to its location near the Galactic Center, since the star formation process there may favor massive objects. Early reports suggested that it might be the most luminous star known, producing almost 100 million times as much power as the Sun.